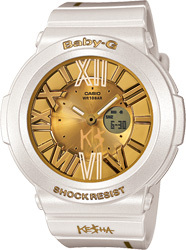 This new model is the product of collaboration between Baby-G and American singer-songwriter KE$HA, whose 2010 debut album reached #1 on the U.S. hit charts. KE$HA is well-known for her innovative, independent spirit, which is reflected in this model. The base model is the BGA-160 with Neon Illuminator, which uses black light that reflects off of the face and glass surface, as well as off of the K$ logo on the face, to create a multi-dimensional world of light on the wrist. The design also use KE$HA’s logo on the face, back cover, and band. Gold coloring on both the face and band is similar to hues that are often used in today’s make up.